Over the holidays I chuckled a little bit every time I saw a commercial for the Microsoft Surface. It wasn’t hard to see the desperation in those commercials that were trying so hard to convince people to replace their MacBook with a Surface. What is pathetic is that these commercials were using the same old tried-and-failed tactics that Old World Technology companies have been using for years with little success. Now they are using them seemingly louder and more often, which only makes them all the more sad. First, the commercials focus almost exclusively on hardware features. From the particular processor they use, to the removable keyboard, to the use of a stylus, the marketing team behind these campaigns still believe that people buy technology devices based on nothing but hardware specifications. That ship sailed way back in 2007 with the introduction of the iPhone. However, it’s the only weapon that Old World Technology companies have in their holsters, so they’ll keep pulling the trigger even if it is out of bullets. The reality is that the commercials don’t mention that these Windows-based devices run Windows 8 because you might as well say these tablets are infected with Ebola. The common perception of Windows 8 is not favorable (to put it mildly) and Microsoft is doing marketing gymnastics to avoid talking about Windows 8 while promoting Windows 8-based devices. No wonder Microsoft has now announced that Windows 10 will be free to Windows 7 and Windows 8 users. 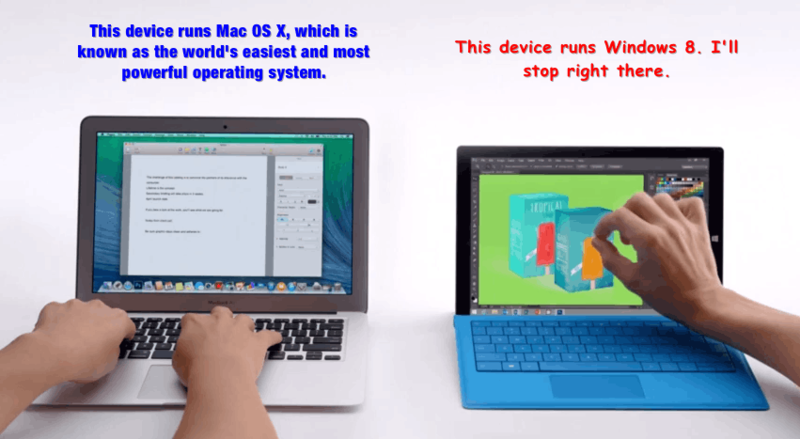 It’s also interesting that Microsoft chooses to compare their devices to a MacBook laptop instead of an iPad tablet. The definition of a “laptop” is blurred, since for what a lot of people do, an iPad is more than enough. People can also buy keyboards for the iPad and make it much more like a traditional laptop. Styluses can also be added to an iPad. However, an iPad starts at $499 where a Microsoft Surface Pro 3 starts at $799. Then to get the keyboard that Microsoft raves so much about will set you back another $129. And don’t think that the keyboard is an “optional” accessory. Attempting to use the Surface Pro without a keyboard is like attempting to use, well, a laptop without a keyboard. So in reality the Surface Pro starts at just under $1000 So maybe now we see why Microsoft wants to position the Surface against the MacBook. The prices are comparable. It is a very tough sell to convince someone to buy $1000 Surface over a $499 iPad. The problem is that people don’t really want a tablet that can replace their laptop. They want a tablet. Just a tablet. A tablet that is simple to use, won’t break the bank, and that doesn’t require overly complex accessories. Let’s talk a little more about the keyboard and stylus that Microsoft thinks are the best thing since sliced bread. As I mentioned above, for all the talk that the Surface is a tablet with an optional detachable keyboard, if you’ve ever used a Surface you know that the keyboard is virtually non-optional. The same thing goes for the stylus. The commercials say, “I can write with a pen.” The reality is, “I MUST use a pen.” Attempting to use the Surface without a stylus is an exercise in frustration. The reason is that for everything that Microsoft says about the Surface Pro being a modern tablet, its operating system is still rooted deeply in the traditional (i.e. Old World) Windows desktop model. Does anyone remember the “Tablet PCs” that Bill Gates declared were “the future” back in the year 2000? Probably not, because if you were unfortunate enough to get suckered into purchasing one back then, you found out that the “Tablet PC” was really just an over-priced, overweight laptop that had a stylus. Sales of the so-called Tablet PCs were abysmal, eerily reminiscent of how the Microsoft Surface line has sold so far. The main problem then, as now, is that attempting to use an operating system designed for a keyboard and mouse with a touchscreen interface is unwieldy, cumbersome, and generally just plain awkward. Of course today Microsoft has Windows 8, which is an operating system designed for tablets and mobile devices so things should be better now, right? Unfortunately, Windows 8 has only made things worse for Microsoft. Windows 8 is a Frankenstein of an operating system, attempting to combine the old desktop paradigm with a new touchscreen interface. The problem for Microsoft is that people nearly universally hate the new Windows 8 touchscreen interface. So they fall back to the familiar desktop Windows interface which is really hard to use with a touchscreen. All the controls are too small to effectively use with a fingertip, so a stylus is not optional but a practical necessity. But then this introduces a new problem: using a tablet with a stylus in one hand is doubly awkward. So that lauded kickstand suddenly becomes not just a nice feature, but something that is absolutely required because you need to put the device down on a table to actually use it with a pen. Suddenly that tablet isn’t much of a tablet. Oh, and hopefully you don’t lose that Stylus because it costs $45 to replace. It’s also easy to lose, by the way, because unlike previous Tablet PCs, there is no place to slide the stylus into when you’re not using it. If you’ve ever attempted to use a Surface as a true tablet, you quickly realize that it is just not the right shape to use effectively. It is simply too tall to use handily in portrait mode (i.e. “vertically”) and too wide to use comfortably in landscape mode (i.e. “horizontally”). It is quite apparent that the Surface line was designed as a laptop with a detachable keyboard. For some reason Microsoft thinks that people really want their tablets to be laptops. But it doesn’t take a genius to see that this is not true. There is a reason the iPad sales took off like a rocket. It was the right combination of computing device with no baggage required. Most people didn’t miss the keyboard. Virtually no one complained that there wasn’t a stylus. For those who did want keyboards and styluses, a plethora of third-party options are available, but the important point is that none of these add-ons are necessary. The iPad works just fine with nothing more than your fingers. Then there are some issues of fit and polish. The fact that the Surface Pro is really just a traditional Windows PC stuffed into a very thin form factor brings along the issues of heat that affect all PCs. One of the first things people will notice about the Surface Pro as compared to other true tablets is the sound. No, not the audio from YouTube videos but rather the sound of a fan. Yes, the Surface Pro requires a fan to keep it from overheating. People will also notice if they hold the Surface is that it gets fairly hot, even with the fan. Not that these issues are truly that big of a deal, but it again just goes to show that the Surface is not truly a tablet, but rather a laptop with a detachable keyboard. A lot of tech companies fail to appreciate the fine little details that can make or break the success of a device. The sum total of all the fine little touches (or lack thereof) in a technology device can be the difference whether people enjoy using a device or begrudgingly tolerate it. Finally, if all that weren’t enough, Windows still brings along the baggage that is malware. Conveniently Microsoft doesn’t mention that the Surface is still as susceptible to malware as any other Windows-based computer. All the detachable keyboards in the world can’t stop a Surface from getting infected with a virus that brings it to its knees. Its stylus can’t remove malware either. In my experience, malware is one of the most frustrating experiences a computer user can have. It is also one of the main motivations for people leaving the Windows platform over the last several years. If we completely ignore every detail I wrote about in the rest of the article, I can’t imagine that people would happily leave the virtually malware-free comfort of an Apple MacBook or iPad to go back to dealing with malware. This issue alone should be a deal-breaker. Until Microsoft can adequately address the issue of Malware, those who use Windows-based devices are setting themselves up for a world of hurt. In all honesty, I think the Surface Pro is actually a very good device for some very particular uses. I have in fact recommended the Surface Pro to a clients as a best-of-breed device when they required a Windows-based laptop/tablet hybrid with a stylus. The main use case are doctors who want to be able to use a stylus when working with Windows-only practice management software. It is a little ironic that the price caused a few of my clients to decline my recommendation, but I digress. I believe Microsoft should stop attempting to sell the Surface as a replacement to the MacBook or even iPad because it just makes them look desperate. Plus if any unfortunate consumers actually believe Microsoft’s commercials, customer dissatisfaction will probably do more to hurt Microsoft in the long wrong.